Cook Book Launch a Roaring Success! 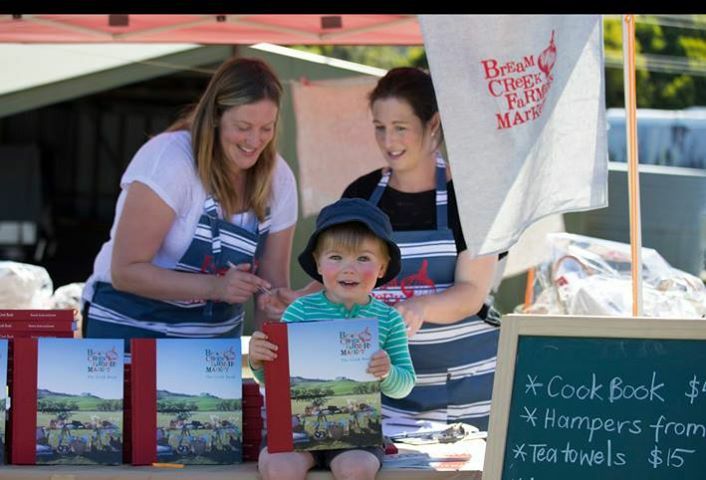 The BCFM Committee would like to warmly thank everyone who came to the Market on Sunday – Elizabeth Knox (president of the Dunalley Primary School Association) offically launched the book and we were thrilled to sell hundreds of copies on the day, as well as lots of our lovely tea towels, aprons and hampers. The Long Lunch was also a huge hit, with chef and cookbook author Eloise Emmett cooking a beautiful lunch for over 100 happy guests with help from the fabulous Dunalley Primary mums and kids. With the long lunch featuring recipes from the new book it was a wonderful opportunity for everyone to get a taste of the amazing produce featured in our beautiful region. The Cook Book is now available from Fullers Bookshop, Dymocks Hobart, The Hobart Bookshop and also available from many of our sponsors – all of whom deserve another big thank you. We could not have made this book without their support and we urge fans of the BCFM to support these businesses – Allure Boutique, Little Quoin Farmhouse, Kate Storey Real Estate, Port Arthur Historic Sites, Tassal, William McHenry and Sons Distillery, The Tasman Gazette and The Sorell Times, Rannoch Quail, Cape Bernier Vineyard, Mures Tasmania, Photography by Alice, Endless Waves Hairdressing, Cunningham Holdings Earthmoving, Dunalley Waterfront Café and Groovy Native Permaculture. We would also like to thank our stallholder sponsors, Bream Creek Vineyard, Gillespies Ginger Beer, Marion Bay Organics, Leap Farm, Psychadelic Juices, Eloise Emmett, Nannas Farm Beauty Products and Frog Hollow Nursery.